New Delhi has always stood tall as the capital of India. Complete with modern architecture, well-built roads and manicured gardens, the city exemplifies this progressive and culturally driven country to a T. However, all that glitters is not gold. New Delhi has been facing some troubles that cannot be excused. New Delhi is the most polluted place on Earth right now, and it’s terrifying for residents. Shortly after celebrating Diwali, a festival originally celebrated by lighting candles and diyas and presently associated with bursting firecrackers, New Delhi has been concealed by a thick coat of pollution. The city’s pollution index shot up to 999, which is over the 500-mark signal threat. The prime minister declared an “emergency situation” in the city on Sunday due to the uncontrollable amounts of toxic smog that sits down heavily on the atmosphere of New Delhi, The Guardian reported. Smoker or nonsmoker, any person walking the streets of Delhi is inhaling the equivalent of over 40 cigarettes a day, according to UPI. 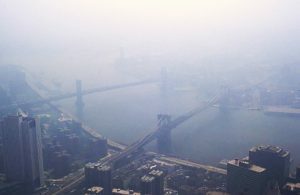 The air quality levels have exceeded the guidelines of the World Health Organization for 80 percent of those living in urban areas around the world. Dangerous smog levels in New Delhi have incited the “smog selfie” movement on social media. PHOTO VIA WIKIMEDIA COMMONS. one might think. I’m sure you’re wondering how the city reacted in such an extreme manner after a festival that’s celebrated annually. Turns out, there’s an underlying explanation that blames Diwali festivities for the city’s dilapidated state. Every year, around the time Diwali rolls around, thousands of farmers in the states of Punjab and Haryana set their fields full of residual crops on fire, leading to a spread of billowing smoke across the North Indian Plain. Added to this problem is the heavy emission of carbon monoxide coming from the thousands of cars on Delhi roads at any point of the day. Steps have been taken to reduce the traffic in the capital and Chief Minister Arvind Kejriwal is set to bring back the infamous “odd-even” driving scheme. With nearly everyone on the streets sporting breathing masks, Delhi is preparing to combat against choking on the toxic air that has come to stay. Breathing normally has become such an ordeal that stores selling the anti-pollution masks have been hoarded with desperate customers, leading to large sales and brisk business. However, it’s good to see that Delhiites have not lost their sense of humor, judging by the “smog selfies” that have been making their rounds on the internet. The photos are part funny, part scary, with the background of every selfie looking like a haze of gray. Hopefully, the residents will get a much cleaner and happier backdrop to their selfies and the “smog selfie” will be a thing of the past.